Typical valve gate designs require pitch dimensions that accommodate the cylinder of each valve gate. 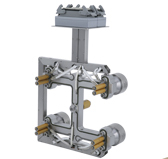 INCOE's Multi-Pin Valve Gate design allows up to four pins per cylinder mechanism easily accommodating small parts. Molds can be manufactured in a more compact size providing cost savings. Multi Pin pneumatic systems utilize the DFQ nozzle design featuring a threaded base which screws directly into the manifold.